How Has AI Impacted the Web Design Industry? The Internet is nothing but a massive reservoir of websites that contain audio-visual content of varying formats and themes. However, we have come a long way in the space of website development, as today we have all kinds of software that can be used by an average person with no programming background to create beautiful and responsive websites in a matter of few hours. In truth, there are many technologies that are pushing website development to great heights, and Artificial Intelligence is easily one of them. Dedicated web development programs such as Dreamweaver have already made web designing a piece of cake. However, for those who seek advanced customization features and highly refined websites that require expert guidance, there are many AI-powered tools that fit the bill. In fact, some of these can automate the entire web-design process for you! A typical AI-based website designer allows you to build a website from scratch by picking the number of pages, divided sections, themes and colors as per your requirements but without dealing with tedious and time-consuming coding and fine-tuning. All you have to do is answer a few questions about the type of website you want to create, and the service will fetch relevant themes, photos, colors, etc. automatically. Popular website hosting and development platform WordPress in particular is offering a slew of AI-based plugins to help you take your website’s UX/UI design to the next level. For instance, you can download SEO plugins, post recommendation plugins, and even chatbots like My Chatbot by Daniel Powney, etc. that are all based on the AI technology. The options for AI-functionality for your website are literally countless today, and they all help you to make your website more dynamic and powerful in one way or another. Websites need branding to appear distinct and meet the marketing goals. However, this was a problem for a long time as the budding entrepreneurs didn’t have access to affordable branding solutions for their websites. So, either they reluctantly settled for professional logo designers and branding experts that charge hefty prices, or simply decided to omit branding altogether. However, AI is bringing a paradigm shift in this matter. Website branding which includes landing page, custom logo, social media banners, etc. has become both affordable and accessible with advanced AI tools such as the Tailor Brands logo generator. With this unique and innovative branding suite, you can create a unique and professional company logo for your business within minutes! With the logo generator, you get a variety of customization features such as fonts, colors, icons, etc. to create the perfect logo for your company. It’s AI technology simply asks you a bunch of questions regarding your company/website like the nature of business, logo styles you prefer, etc. and then auto-generates a few carefully crafted logos for you to pick from. After you choose a logo, you can make final adjustments to the text, color, etc. When you are done, you can download it in any media format you prefer and incorporate the same into your website easily! Expert web designers know that user interface (UI) and (UX) go hand in hand. In fact, they both are important for the success of a website as they complement each other. Now, the thing is that the web designers started using AI to improve UI a long time ago. However, it’s only now that they are using it to take the UX to the next level as well by devising various applications. Online shoppers and service users prefer text-based communication, preferably real-time chats over talking on the phone or even emails. Thus, there is a huge demand for smart AI-powered chatbots that can answer customer queries just like a real customer executive. AI-chatbots are capable of addressing the majority of standard queries and are available 24/7 hours a day unlike a full-time employee, which is also, by the way, more expensive. 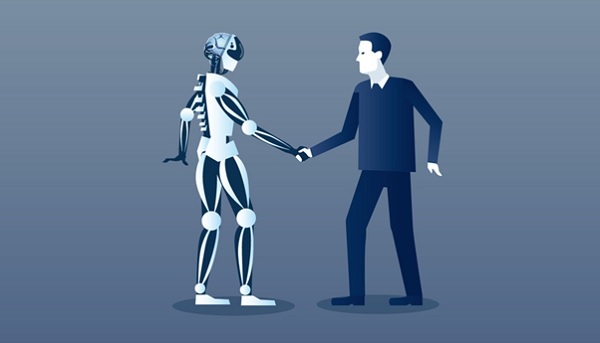 In addition to that, a bot can offer a personalized service by going through the chat history of a customer and learn about their requirements and preferences over time with machine learning. Online stores want to give a personalized experience to their customers just like the brick and mortar stores do, and it has a huge potential too. For instance, the findings from Gartner’s 2017 digital commerce research show that predictive analytics and personalization in online commerce, which is what an AI can easily do, can increase the profits of an e-commerce website by as much as 15%! The thing is that an online store can increase sales only by making it easier for their customers to find the products they are actually interested in. This is where predictive analytics and machine learning comes in. Similarly, if it can learn what their customers are feeling about certain products and sellers (through reviews and ratings), it can make improvements accordingly. This is where Natural Language Processing (NLP) comes in. Gone are the days when AI used to be just a buzzword thrown around for “experiments” in the tech space. Today, it’s become a highly-matured technology that’s bringing radical transformations in our lives. We are using AI to run driverless cars, and in mobile phones to capture the perfect photos. We have also led rise to the smartest chatbots that one can have human-like conversations with, and of course, tools like logo designers, website designers, etc. that allow an average small business owner to stand out and give the top companies a run for their money. If the rate at which new AI programs are being developed is any indication, we shall be able to get our hands-on AI software of unimaginable intellectual capacity in the near future in web design and other domains. That said, only time can tell for sure. What Will Be the Next Big Thing in App Design for 2019? AI is the very advanced thing that developers are making it and it is going to be very useful for the web design also.